The Federal Reserve Board recently reported that consumer credit outstanding rose by a seasonally adjusted annual rate of 6.7%, $229.2 billion, in July 2015, slower than the 9.5% rate of growth recorded in June. Consumer credit outstanding now totals $3.453 trillion. The expansion of total consumer credit outstanding partly reflected an increase in the outstanding amount of non-revolving consumer credit. Non-revolving consumer credit includes auto loans and student loans. According to the report, non-revolving credit outstanding grew by a seasonally adjusted annual rate of 7.0%, $177.3 billion, in July, 1.7 percentage points slower than the 9.3% growth rate recorded in June. There is now $2.539 trillion in outstanding non-revolving credit. The increase in total consumer credit outstanding also reflected an expansion in revolving credit outstanding. Revolving credit outstanding, largely composed of consumer credit card debt, grew by a seasonally adjusted annual rate of 5.7%, $51.8 billion, in July, 4.3 percentage points slower than the 10.0% growth rate recorded in June. There is now $915 billion in outstanding non-revolving credit. A previous post demonstrated that, as a group, depository institutions are the largest holder of consumer credit outstanding. 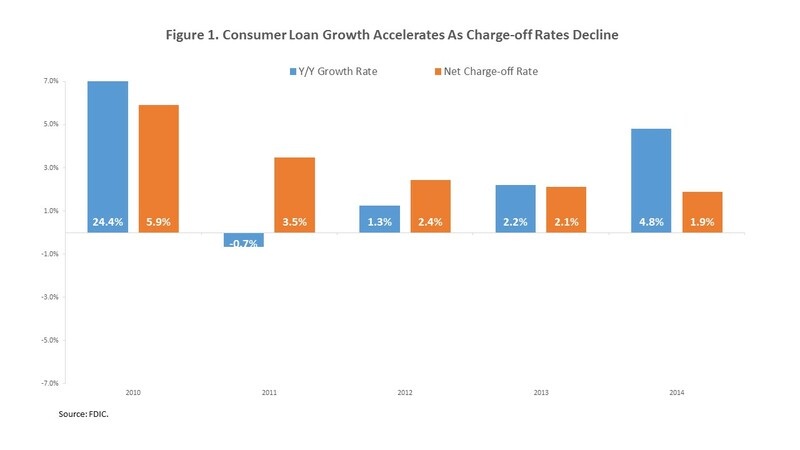 In recent years, growth in these loans has been accelerating. Over the same time period, the net charge-off rate has been declining. As shown in Figure 1 above, the outstanding amount of loans to individuals rose by 24.4% in 2010. However, as discussed in an earlier post, this increase largely reflected a shift of consumer credit from pools of securitized assets back onto the balance sheets of such lenders as depository institutions. The reason behind the shift was implementation of the FAS 166/167 accounting rules. In 2011, the amount of outstanding loans to individuals fell by 0.7%. However, in each year since 2011, the year-over-year change in loans to individuals has progressively improved. By 2014, the outstanding amount of loans to individuals expanded by 4.8%. Conversely, the net charge-off rate on loans to individuals was 5.9% at the end of 2010. This was the peak level reached following the financial crisis. In the years following, the charge-off rate has declined by 400 basis points to 1.9% at the end of 2014. The Federal Deposit Insurance Corporation’s Statistics on Depository Institutions provides data on the balance sheets of depository institutions. The Statistics on Depository Institutions is a quarterly publication compiled by the Federal Deposit Insurance Corporation (FDIC) that provides detailed aggregate financial information as well as key structural data, such as the number of institutions and branches for all FDIC-insured depository institutions. The balance sheet of all FDIC-insured commercial banks can be isolated by bank size, as measured by total assets. Its line item “loans to individuals” is the total amount of credit cards, other revolving credit plans, automobile loans, and other loans to individuals. According to the FDIC, “other revolving credit plans” include all extensions of credit to individuals for household, family, and other personal expenditures arising from prearranged overdraft plans and other revolving credit plans not accessed by credit cards. Prior to 2001, this item was reported as part of credit cards. “Other loans to individuals” encompasses household appliances, repairs or improvements to the borrower’s residence not secured by real estate, educational expenses such as including student loans, medical expenses, personal taxes, vacations, consolidation of personal nonbusiness debts purchases of real estate or mobile homes that are not secured by real estate but are to be used as a residence by the borrower’s family, and other personal expenditures. Prior to 2011, automobile loans were included in other loans to individuals.